Something bad happened Saturday; it rained. Not a lot, but enough to make the old ceiling at Bishops leak. We were lucky though because not only was it a "small" leak, it happened to leadk only on the register/desk portion of the store, sparing all yarn! 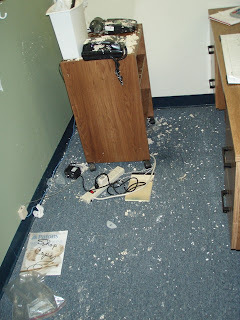 Something bad happened Saturday; it rained - not a lot, but enough to make the old ceiling at Bishop's yarn shop leak - we were lucky though because not only was it just a "small" leak, it happened to leak only on the register/desk portion of the store - sparing all the yarn! 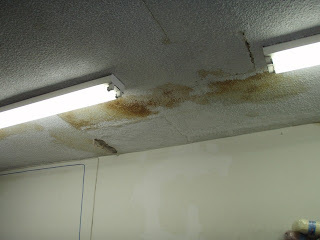 We knew about the previous leaks from the stains in the ceiling - I had talked about painting the ceiling at one point, and had not thought for a minute that the roof would still leak! I am also happy that we didn't go through all that work just to have it destroyed by some rain and water! SO - Florence (the owner of the shop) is going to order a new card machine, and the landlord is fixing the roof. He came out on Saturday and did some repair/patch work. I hope that he repairs it the right way this time to keep something bad happeneing to the yarn in the shop! Moving on to the other fun event: Gregg's sweater is ripped apart (Thanks, Florence!) - I didn't get rid of the bottom cable band or one of the sleeves yet - I won't reuse either of them but I decided that I shouldn't go through the work of ripping these pieces unless I have to use that yarn... so I'm being patient and waiting. I started a new sweater this weekend - it's a neat v-neck with ribbing on the sides - and stockinette in the front and back - it seems to be a good match for the yarn so far (although I STILL think the stitches look loose) - I have decided to call it my "Phoenix" sweater - for the yarns ability to rise from the ashes and become something new. I am also kind of excited at the idea that this tragic sweater can be knitted up, analyzed, and dissected - from dust to dust, yarn to yarn - and if I'm careful, I could keep doing this over and over - knitting up fabric, looking at it and then ripping it out --- yarn is kind of like play dough! 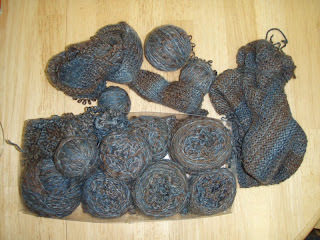 - how cool that the sweater I make consists only of a continuous strand of fiber! We also had knit night again on Friday at the house - Chuck, Vera, Terry and I attended, Gregg had another friend over to entertain him while we knit. I have become a knitting fiend - knitting at gatherings, in the car, and I have decided that it's just too far to try to knit in my sleep; although I think it's a good idea (sleeping should be productive too) I think I'll drop too many stitches!